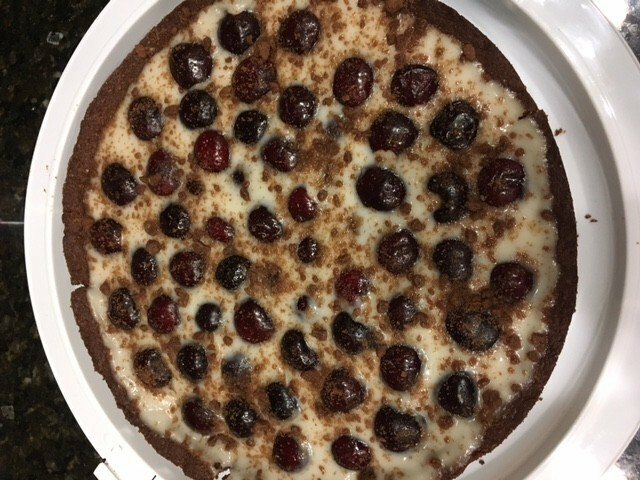 For the fresh Bing Cherry Tart pictured above, I put one box of Annie’s chocolate grahams in the food processor with about 4 tablespoons melted vegan butter and processed until crumbly. I added a couple of teaspoons of water to bring it all together. Since the cookies were already sweet, I didn’t add any sugar. The amount of water used will depend on the moisture content of the cookie you select. Press the crumb mixture firmly into a tart pan, spreading it evenly along the bottom and up the sides. Refrigerate while you are preheating the oven to 375 degrees Fahrenheit. When ready, bake the crust for 12-15 minutes, or until slightly golden and fragrant. Allow to cool while you make the custard. For the custard, I whisked together 2 cups coconut milk, 3 tablespoons cornstarch, ½ cup sugar, 1 teaspoon vanilla extract in a saucepan. On medium-high heat and stirring constantly, I cooked the mixture until it began to bubble, thicken, and coat the spoon, then lowered the heat and cooked for an additional minute. Pour into a clean bowl and allow to cool for ½-hour in the refrigerator, stirring several times or covering with plastic wrap to avoid a skin from developing. While the custard is cooling, prepare you fruit. In this case, I pitted the cherries. When the custard is cooled, spread it evenly in the tart shell, then gently push the cherries in to the custard. Return to the refrigerator for at least 2 hours, but 4 preferably, before serving.